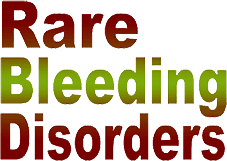 The Rare Coagulation Disorders Resource Room (www.rarecoagulationdisorders.org), a dynamic, open-access website, was developed through a collaboration of the international RBDD Registry (http://www.rbdd.org/), the Indiana Hemophilia & Thrombosis Center (www.ihtc.org), and the Rare Coagulation Disorders Subcommittee of the National Hemophilia Foundation (NHF, www.hemophilia.org), a group appointed by NHF’s Medical and Scientific Advisory Council. The Resource Room provides current and searchable information on the basic science, clinical management, available laboratory and genetic testing, clinical trials, and global research initiatives for these very rare and heterogeneous coagulation disorders. This website was created to address the needs of both individuals with rare coagulation disorders and their health care providers. Health care professionals often have little experience treating these disorders, with limited resources for their diagnosis and treatment. Moreover, as rare coagulation disorders represent a small potential commercial market, few, if any, specific therapies exist for these conditions. As a result, affected individuals often face delayed diagnosis, insufficient laboratory evaluation, and limited treatment options. Recent pharmaceutical efforts have focused on the development of safe and accessible products for a few of these rare disorders. In addition, global registries and networks have been developed to provide coordinated and consistent data collection to increase knowledge of these conditions, their sequelae and management. Ongoing efforts continue to promote international data harmonization. In the United States, the American Thrombosis and Hemostasis Network (www.athn.org) is expanding its data collection system to assure inclusion of individuals affected with these rare coagulation disorders who are followed through the U.S. federal hemophilia treatment center network. In Europe, Dr. Flora Peyvandi, under the auspices of the International Society of Thrombosis and Haemostasis, has spearheaded the development of an international network of care providers and a registry to better identify the number of affected individuals worldwide and define the clinical manifestations and sequelae of these disorders. The Rare Coagulation Disorders Resource Room is an important step in a global program to further enhance these efforts, with the goal of improving the health and quality of lives of individuals with rare coagulation disorders. We encourage the international rare coagulation disorders community to contribute to, and benefit from, this global endeavor.